This clock looks to be made to sit on a mantle piece with a Victorian Era look. 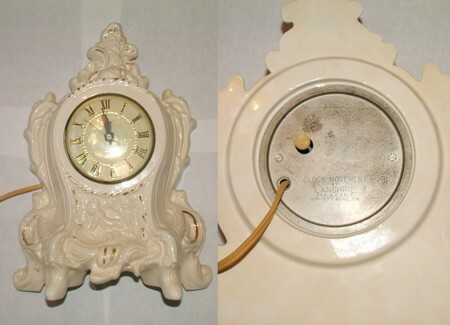 It is glazed white, and has some decorative gold paint applied sporadically over the front of the clock. Beneath the clock face is a scene depicting two angelic cherubs. The clear shield covering the clock face is plastic. The back of the clock has a circular metal piece stamped with the words, " Clock Movement by Lanshire." It is an electic clock, and it is still operational. The chord may have originally been white, but has darkened to beige with age. There is a maker's mark between the legs of the clock at the base, which says "Holland Mold". The clock is approximately 11 inches tall, 7.5 inches wide, and about 2.5 inches deep. It weighs approximately 2 lbs. The clock is not dated, but it is at least 30 years old and in good working condition. 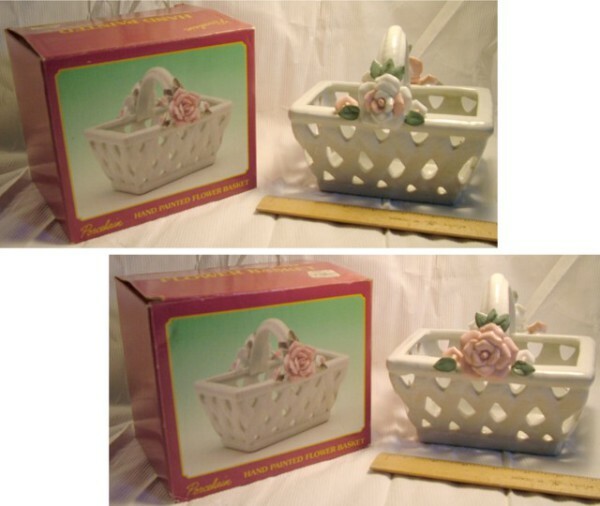 This porcelain hand painted-flower basket has never been used and is still in it's original box. The original price marked on the top of the box is $7.95. It is glazed with glossy white ceramic paint, the flowers are pink and white, and have green leaves. Any flaws on this piece are naturally incorporated into the glaze. This basket is about 7 inches long, 6 inches tall to the top of the handle, and 4.5 inches deep. It weighs approximately 2 pounds.